Masala Vadai - delicious evening snack prepared with chana dal or yellow split peas as the main ingredient. 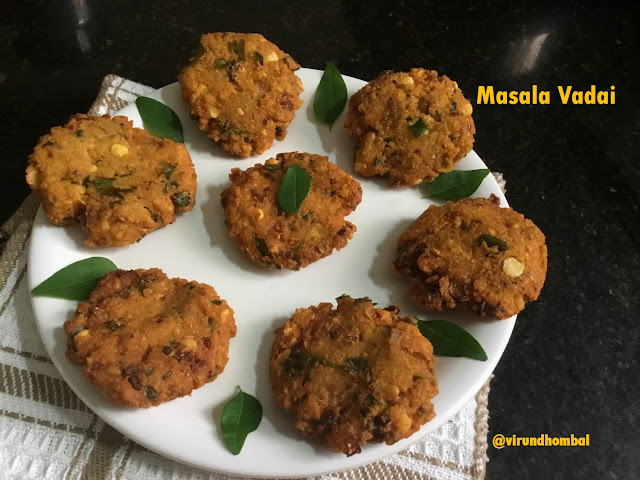 This masala vadai is not only an evening snack, but it is also a favourite side dish for our lunch too. Really, I enjoy this masala vadai with lemon rice and curd rice. 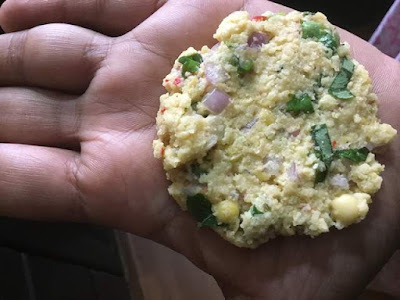 Most of our traditional snacks are easily prepared with healthy ingredients using simple methods. Masala vadai requires simple preparation works like soaking and grinding the dals. These two methods require some attention so be careful while preparing the dough. 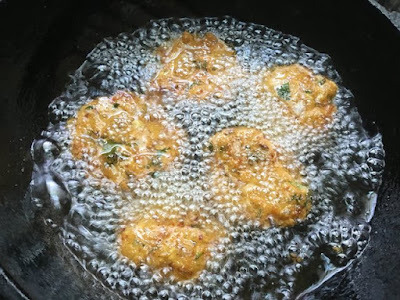 The most important thing in this masala vadai is we have to soak the dal for 3 to 4 hours. 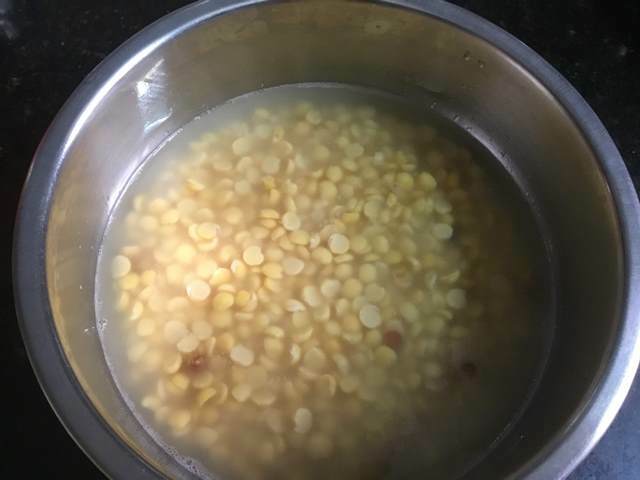 Soaking the dal for 4 hours, helps to grind the dal without any water. 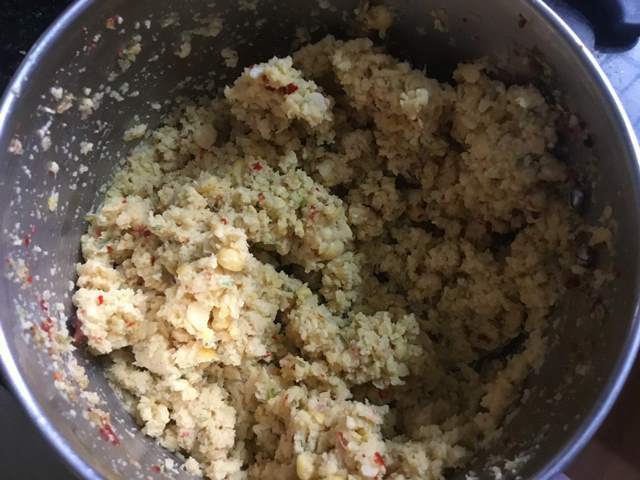 After 4 hours, drain the water completely using a strainer and then grind it. If the soaking time is less, you will not get a crispy vadai. 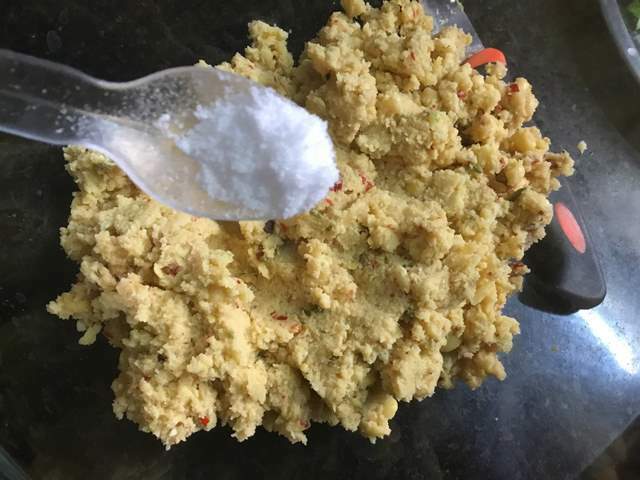 For this masala vadai, we have to add both red chillies and green chillies, ginger, garlic, fennel, cinnamon and asafoetdia are added for flavours. 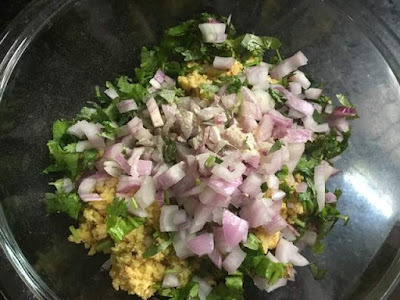 The other toppings are chopped onions, coriander leaves, curry leaves and mint leaves. As usual, my preference for deep frying is groundnut oil but you can use your favourite. Take a wide vessel and add the yellow split peas or chana dal. Add 5 to 6 cups and soak it for 4 hours. 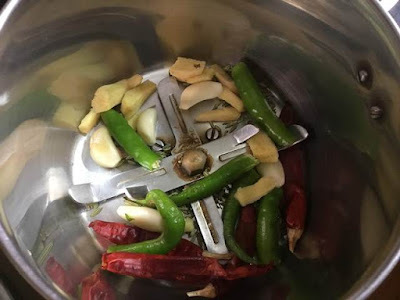 After 4 hours, rinse the dal in water for 2 to 3 times and drain the water completely. Now place a strainer on the top of a vessel and add the soaked dals to it. 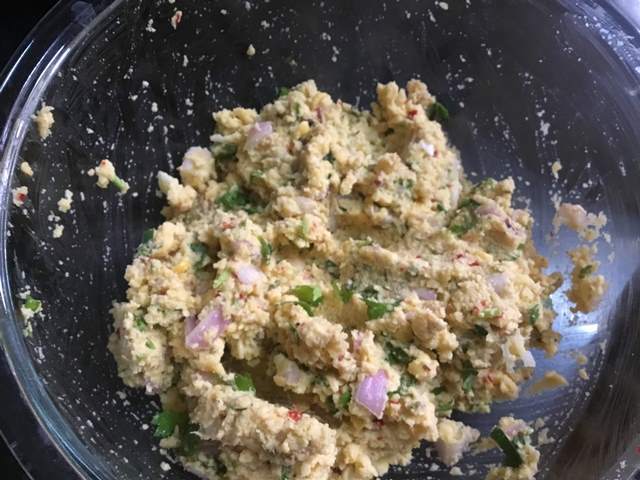 Take a big mixer jar and add the green chillies, red chillies, ginger, garlic cloves, cinnamon and fennel seeds. Grind them first without any water. Next, add the drained dals in two batches and grind it. Scrape the sides of the mixer jar with your hand or ladle and grind it. No need to add any water. Now transfer the ground batter to a mixing bowl. Add the required salt and mix them gently. Gently mix the ground batter with all the remaining ingredients one by one (chopped onions, coriander leaves, mint leaves, curry leaves and asafoetdia powder). Mix them gently with your palm. 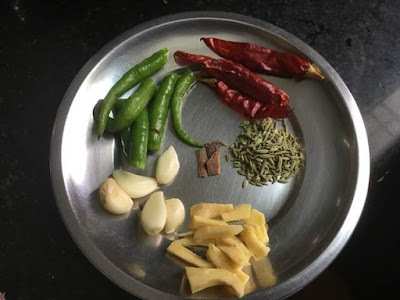 Heat the groundnut oil in a deep frying kadai on medium heat. Now take a medium size ball from the dough and flatten it and add it to the hot oil. 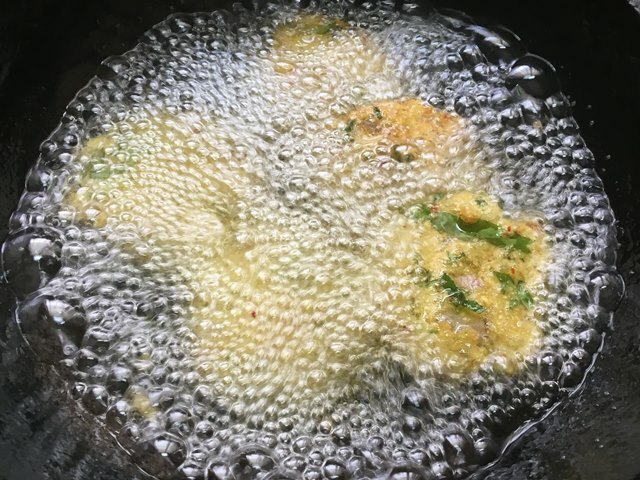 After a few minutes, flip the vadas and deep fry until it turns golden brown and transfer it to the bowl. 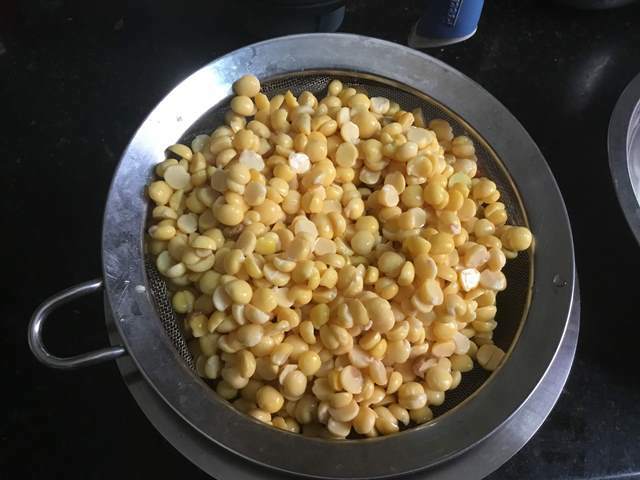 Take a wide vessel, measure and add the yellow split peas or chana dal. Add 5 to 6 cups and soak it for 4 hours. After 4 hours, rinse the dal in water for 2 to 3 times and drain the water completely. Now place a strainer on the top of a vessel and add the soaked dals to it. Gently shake the strainer with your hands for every 5 minutes and drain the water completely. You must drain the water completely. Shake the strainer again and again. Keep all the ingredients ready for grinding. 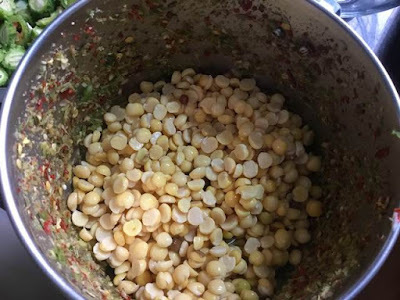 Next, add the drained dals in two batches and grind it. Scrape the sides of the mixer jar with your hand or ladle and grind it. No need to add any water. Use the big jar which we grind for making spice powders or jar with four blades. 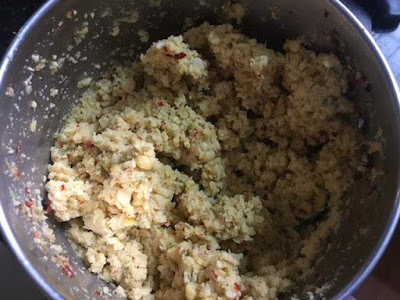 Gently mix the ground batter with all the remaining ingredients one by one (chopped onions, coriander leaves, mint leaves, curry leaves and asafoetdia powder). Mix them gently with your palm. After a few minutes, flip the vadas and deep fry until it turns golden brown and transfer it to a plate or bowl. Serve it hot with a cup of coffee or tea. 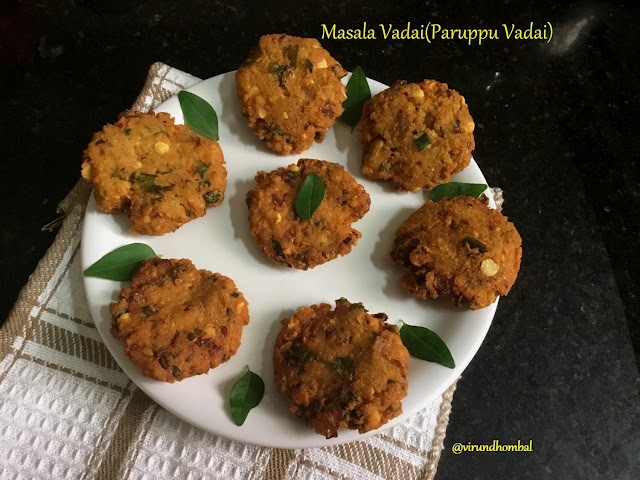 You can also enjoy this vada for your lunch.